Two of the hottest trends in home building -- tiny houses and prefab houses -- combine in the pages of Prefabulous Small Houses. 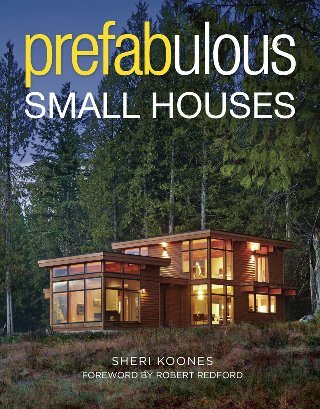 The latest book from author Sheri Koones, Prefabulous Small Houses (The Taunton Press, $32.00, 240pp;) explores the beauty, variety, design, and positive benefits of small-scale, prefab construction. More than 30 prefab homes ranging in size from 350 square feet to 2,000 square feet from around the nation are showcased; 250 stunning color photos and 32 floor plans provide all of the inspiration you need to think small, smart, and prefabulous. A foreword by actor and environmentalist Robert Redford speaks to the urgency with which we must act to combat climate change and how prefabricated small homes have a role to play in the challenge. 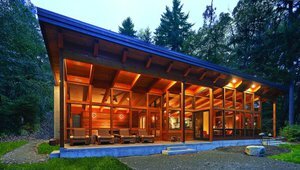 Homeowners, remodelers, builders, architects, and designers will love the innovative technologies and environmentally friendly prefab design ideas presented. Sheri Koones is an author whose previous books include Modular Mansions, Prefabulous, Prefabulous + Sustainable,Prefabulous + Almost Off the Grid, and Prefabulous World. She won the prestigious Robert Bruss Real Estate Book Award from NAREE (National Association of Real Estate Editors) in 2008, 2011, and 2013. Koones is also a columnist and speaker who lives in Westport, Connecticut. In an exclusive interview with ProudGreenHome.com, Koones discussed the tiny house trend, prefab houses, and the difficulty of picking out her favorite home profiled in the book. PGH: How did you get started writing about home construction? SK: In 1998 I did a major renovation on a house in Greenwich, Connecticut, where I was living. I didn't know anything about home construction so I did a massive amount of research. When I got finished I decided I would write a book for those people like myself that were clueless about construction. Then a friend was building a modular home, and I was totally blown away after watching my house be painstakingly built, this house just appeared. The next day after it was set in place we walked up the stairs, and the house was pretty much done. So my next books were on modular homes. PGH:What interested you about modular and prefab homes? SK: Back then when you talked about modular homes, people thought of doublewide trailers. I wanted to make the case of how beautiful modular homes could be, and so my first prefab book was Modular Mansions. In researching that book, I started to see that people were building so much more efficiently and sustainably, so the next books I did were Prefabulous + Sustainable and Prefabulous + Almost Off the Grid. Then I took a look at what people doing in prefab globally in Prefabulous World. PGH: So how does the world of prefab houses intersect with the tiny house trend? SK: People are just thinking they want to go smaller, and particularly the next generation of people are more interested in having less stuff and more life experiences rather than taking care of a home. PGH: Will the tiny house trend move from a novelty to the main stream? SK:For some people the tiny house is a great idea. For people who travel a lot for their work, and they are in different places for a short time, I think it can be very good. For most people I think they're better off in a house with a regular foundation which is more secure and where they have the convenience of water and electricity and sewer systems. PGH: How do you look at prefab or factory built homes in the marketplace? SK: There are different types of prefab, most people associate prefab with modular homes, but there are many other types of prefabs. The home on the cover of the book is a kit type construction where the company cuts all of the parts, including the windows, and they go out to the builder and the parts are numbered and it's like putting together a puzzle. And then there's structural insulated panels, and modular, and then concrete panels, and insulated panels, and prefabricated log homes and timber frames all different combinations of those. They are different than manufactured homes, which are built on a metal chassis, and come on wheels. They always have wheels, though they are very often hidden. They meet the HUD code, not local building codes. All of the houses that I write about meet the local codes and don't have wheels, although in some cases they have metal frames but they are very different from trailers or HUD-type houses. PGH: What are some of the barriers and benefits of prefab and systems-built home construction? SK: A lot of builders don't want to let go of building on site because that's what they know that's what they've been doing for the last 30 years. A lot of them feel like they would lose money by doing this. On the other hand, if they are the contractor on a modular or some other type of prefab house, they're going to be able to build many more houses and if they get connected to a good factory, they will get lot of customers through factory recommendations. For architects, they get to do the creative part, the construction drawings are most often created by the manufacturer, so they don't have to do all that real tedious work and they get to do more creating. When people start building prefab, they never go back. A builder I know in Washington he just tested building using SIPS and after he built with it, he never went back to building any other way. He said it was the most efficient way of building; it was fast, and it made the house very energy efficient. I've dealt with homeowners in several books, and I've had heart surgeons and nuclear physicists, they are smart people and they try to find the best way to build and a lot of these people decide to build prefab. So it's not a default way of building, it's the choice when people make the effort and decide this is how they're going to build because it's better. PGH: Do you have a favorite house from the book? SK: There are 32 houses in the book, it's like asking a parent, Do you have a favorite child? I think they are all special in their own way. The one on the cover is a Lindal home, it is just a gorgeous house and the setting is beautiful, I love the Casita, it's so small and they use the space so beautifully. Every time I work on another house, every time I interview the architects and builders, I say this is my favorite house. Every time I heard what they did, I was fascinated. I had my choice of hundreds of houses to choose form, and these were the 32 that I chose. Read more about prefab and systems built homes. Gary Wollenhaupt is an experienced writer and editor, with a background as a daily newspaper reporter as well as corporate and agency public relations and marketing. 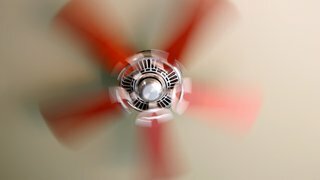 He is constantly looking for affordable green upgrades to make to his home in eastern Kentucky.